You are welcome at SIUE! I hope you are still considering submitting an application to SIUE. I think you will find SIUE is an excellent choice for your education. SIUE is a welcoming campus, and the location is ideal. The 2,660-acre campus features beautiful landscapes, bike trails and gardens. Located in Edwardsville, Illinois, our campus is ranked 11th in the U.S. among the safest colleges campuses, according to the National Council for Home Safety and Security. The campus is just 25 minutes from St. Louis, Missouri, where you can access cultural events and convenient travel options from St. Louis Lambert International Airport. 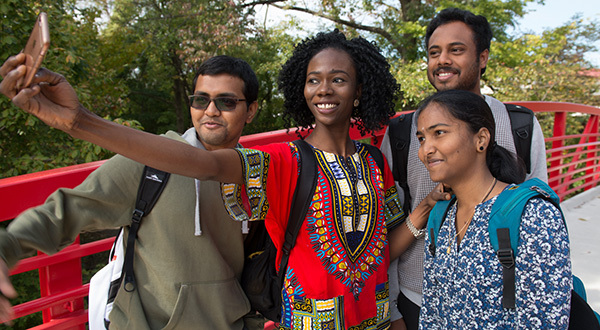 Home to nearly 400 international students and scholars, SIUE offers a rich cultural environment that contributes to the learning process. We offer strong support with admissions, immigration and academic advising services targeted to international students. There are also more than 300 student organizations, including an international student club, to help students make connections. SIUE offers a diverse residential community, with on-campus housing options that include residence halls and shared apartments. There are plenty of recreational opportunities available, including intramural sports, a student fitness center, and theater and dance productions. So take some time to explore our campus and find out all the ways that SIUE is the right choice for you!